It is the new normal to be sexually promiscuous in these times of seemingly constant titillation through popular clothing fashions and all forms of media. The standard is to be different by making a decision to stay chaste until marriage and practicing fidelity in marriage. This is only possible through a growing, personal relationship with Jesus the Christ. Lean into Christ to prepare you for the level of commitment marriage requires and in obedience you will honor the Father. 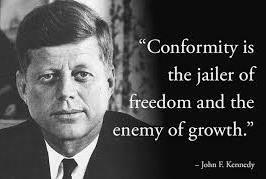 It is normal to conform to relative truths in this world as they relate to perversion of life, liberty and the pursuit of happiness. The charge is to be different by walking under the influence of the absolute Truth with the grace that is Jesus the Christ in your life. You will be a compelling example for those in your circles and in obedience you will honor the Father. Pray and read scripture several times a day. Worship Who deserves our worship, our Heavenly Father, and study His word daily. Be frugal and a good steward of the gifts you have been blessed with. Stand out as a Kingdom influence where He has you. Prayer: Lord, I confess the sins of man today, including myself and my father’s house. We, the Church, have conformed to society more than we want to admit. We have been unfaithful to You. We have turned from Your calling for us as men, husbands and fathers but desire to return to You in obedience. Equip us to be faithful in Your sight and guide us to be different in this world in a way that honors You. Amen. A faithful father stands out to be absolutely different in a relative world. Please comment on ways you can be different for the sake of raising a godly generation. Saying no to "reasonable" faith is hard to do in this world filled with "reasonable" people. Thank goodness our God is not "reasonable" but rather absolute in His truth. Well said! Itching ears love "reasonable" faith that references relative truths. When the Word became flesh, Jesus walked in radical faith grounded in absolute Truth that honored His Father.